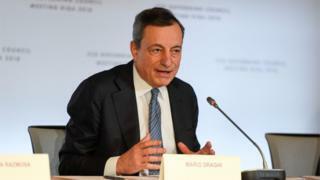 The European Central Bank has confirmed it is ending its huge net asset purchase programme to stimulate the eurozone economy this month. The ECB has stopped its bond-buying scheme, worth €30bn a month, despite a recent slowdown in the bloc's recovery. The move, first announced in June, is a big step towards unwinding the policies brought in to stabilise the eurozone in the wake of the financial crisis. The ECB said it was keeping its main interest rate on hold at zero per cent. The ECB began its asset purchase programme in 2015, years after the UK and US took similar action to shore up their economies. The bank argues this has countered deflation and staved off a deeper economic crisis, but it has long signalled it would gradually wind the programme down. It's official: the ECB has confirmed it will cease its crisis bail-out programme, quantitative easing. It was last of the major central banks to embark on the scheme of pumping funds into the economy via bonds in 2009. Since then it has injected more than €2tn, intended to be used by financial institutions to boost credit, and so demand across the economy. QE was a controversial project, not least with European politicians. And it is for political, rather than economic, reasons that it's been ceased: growth across the eurozone is lukewarm. The ECB isn't removing its support altogether; it will reinvest existing QE money once bonds mature. But economists question if the ECB may soon have to take further action to stimulate growth and, with interest rates at rock bottom, what shape that will take.